RichMan Games - Play Monopoly Board Games on your computer. ...... You can host a game night with family and friends. Now, Let us join in on the "rags to riches" fun! Do you want to be the owner of Empire State Building? Do you want to be the Oil Magnate? Just Play RichMan! Play Monopoly Board Games on your computer. * Boss Key (Escape) - Hide/Show the game quickly. * Play Monopoly games on your computer. * Single-player game mode - You can play with the smart computer player. * Multiplayer game mode - Play with family and friends. Host your game night. * New Map & Feature - Placed in New York City & Added Hostile Takeover Feature. 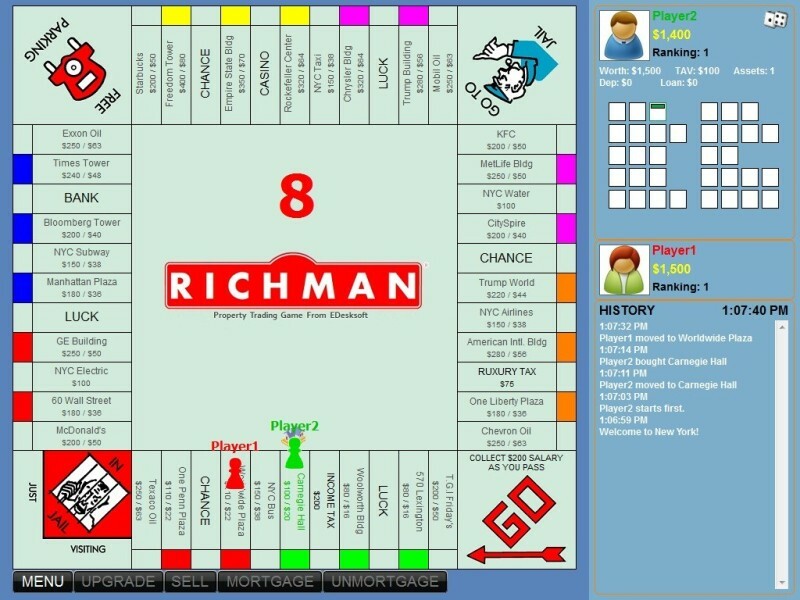 * Simple Rules - If you enjoyed playing Monopoly board games then you will like Richman! Monopoly Twisted! Same game, new twists! Three educational games that teach the names of music symbols. A pack of six engaging puzzle games. Qweas is providing links to RichMan Games - Monopoly of New York 1.4.389 as a courtesy, and makes no representations regarding RichMan Games - Monopoly of New York or any other applications or any information related thereto. Any questions, complaints or claims regarding this application RichMan Games - Monopoly of New York 1.4.389 must be directed to the appropriate software vendor. You may click the publisher link of RichMan Games - Monopoly of New York on the top of this page to get more details about the vendor.